In the mountains of Haiti, a child living in poverty receives the vaccines he needs to stay healthy thanks to international support for a clinic that sends health workers to homes. In a rural village in Malawi, an adolescent girl is able to avoid marriage and stay in school because advocacy groups and citizens worked with local communities and the government to change the law. 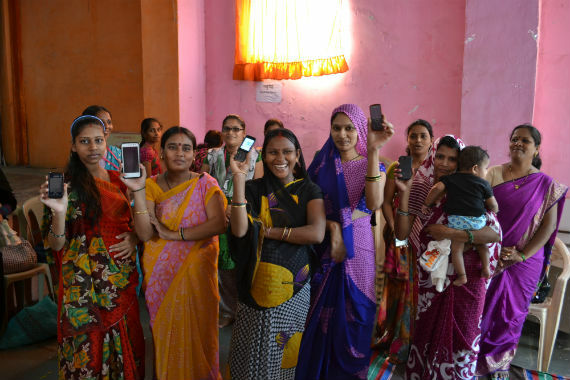 And in a fishing community in India, an expectant woman without easy access to health care receives vital information for a safe pregnancy through her mobile phone thanks to an alliance of businesses, governments, local non-governmental groups, and community workers focused on mobile health for mothers. These stories of progress are also stories of partnership. As we prepare to launch the next set of global development goals, known as the Sustainable Development Goals, partnerships like these are more important than ever. Goal 17 of the global goals aims to: "Strengthen the means of implementation and revitalize the global partnership for sustainable development." It addresses the partnership between governments and many issues related to it, such as aid, financing, technology, and trade. These issues are critical to the success of the global goals, but governments alone won't be able to solve our challenges. We need every sector to engage. That's why, on a broader level, the global goals call for "the participation of all countries, all stakeholders, and all people." Each of us can play a role in building a better world -- and when we break down silos and work together, we can go further and faster. One of the lessons we learned from the Millennium Development Goals, the predecessor to the next set of goals, is that cross-cutting challenges require cross-sector solutions. For example, maternal- and child-health problems range from malnutrition to lack of access to vaccines and family planning to a shortage of skilled birth attendants. No one sector or country has all of the answers, but many organizations and institutions have many answers -- and when they bring their respective strengths and resources to the table, the sum is greater than the parts. That's why, in 2010, UN Secretary-General Ban Ki-moon launched the Every Woman Every Child movement to mobilize companies, governments, foundations, research institutions, and advocacy groups to make progress on women's and children's health. To date, more than 300 organizations have made more than 400 commitments in areas from expanding access to family-planning services to training more midwives to researching new technologies to increasing funding for women's- and children's-health programs. It promotes innovation through a working group focused on the topic. The good news: We're seeing results. Maternal- and child-deaths rates have fallen in all 49-targeted countries, and since 2010, 2.4 million lives have been saved. More women are giving birth with skilled attendants and receiving post-natal care. More infants are receiving treatment to prevent deadly diarrhea. And more money is being pledged for women's and children's health. Now we need to build on this momentum to end the preventable deaths of women and children and achieve our broader global to-do list. Soon, the Secretary-General will launch an updated Global Strategy for Women's, Children's, and Adolescents' Health for the new era of sustainable development. Multi-stakeholders partnerships, including Every Woman Every Child, will play an important role in delivering results on the next global-development agenda. As we tackle big, connected issues, cooperation and collaboration will be key. Through partnership, we can translate the Sustainable Development Goals from words on paper to change around the world. It will take all of us to get it done -- and we will all benefit from living in a more sustainable, prosperous, peaceful planet.